Many great cities are simplistically defined by their unique international icons: Paris has its Eiffel Tower; London has "Big Ben" and the Houses of Parliament; Rome has the Vatican and the Coliseum; Madrid has its bullring; Washington has the Washington Monument, the Capitol and the White House; Venice has its great tower, St. Mark's and the Doge's Palace; Rio de Janeiro has its mountain-top statue of Christ; Moscow has the Kremlin and its bulbous domed churches; Athens has the Acropolis; and New York has the Statue of Liberty, its skyline; the canyons of Wall Street; the Great White Way of Times Square; Rockefeller Center, and Carnegie Hall. While Carnegie Hall is primarily a concert hall, it has become the definitive embodiment of the ne plus ultra, the attainment of extraordinary excellence. For over a century, it has been the dream and crowning achievement of every musician to perform at Carnegie Hall. 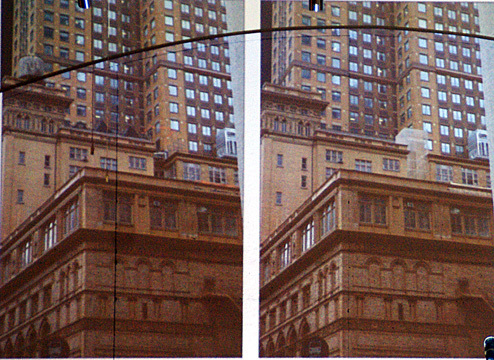 Before the erection of its adjoining office tower in 1990, Carnegie Hall, shown in the foreground in the photograph at the right, was not very imposing on the outside, a caramel-colored brick and terra-cotta building in an Italian Renaissance-revival style that had been substantially altered in the first decade of its existence and is marred by fire escapes on its Seventh Avenue facade. While its arches and belt courses and cornices were pleasant, the building's exterior was more cozy than cosmopolitan, more mundane than monumental. Its 2,760-seat, multi-balconied, main concert hall, however, was, and is, very handsome in its dimensions and most notably in its acoustics. The concert hall's design was attractively Palladium in its Classical touches, but not lavish. The emphasis was, and is, on the music. Apart from its acoustical heritage, the original building and its small tower additions at its west and south ends were very important precursors of the major mixed-use building type for they contained offices and studios that over the years have housed many famous musicians, architects, agencies and dancing classes. Indeed, wandering through its office and studio floors is one of the great experiences in the world. Although it was not based on Carnegie Hall, Francois Truffault's greatest film, "Tirez Sur Le Pianiste" (Shoot the Piano Player, see The City Review article)," has a scene that wonderfully epitomized such an experience. The film's lead, Charles Aznavour, plays a pianist who goes to an impresario's office for an audition. A woman violinist is shown walking down a long corridor after having just left the impresario's office that Aznavour has just entered. Half way down the corridor, she hears heavenly piano music coming from the impresario's office and the camera lingers on her mesmerized frustration as she continues down the corridor trying to contain her awe and anger and the remnants of her life. Such incidents must happen regularly in these precincts. The office and studio floors have broad corridors and wide staircases with ornate balustrades and because many of offices and studios are double-height it is very confusing with many levels that are not subject to simple numbering. The Carnegie Hall building also contains a smaller recital hall and, in its basement, a very elegant auditorium that for many years until 1997 was the city's most attractive movie theater, the Carnegie Hall Cinema, with an entrance on Seventh Avenue. Carnegie Hall subsequently announced it would raise funds to convert it to a concert hall. The new Zankel Hall was scheduled to open in late 2003. The new office tower is the city's greatest contextual construction project and befitting the heritage of its namesake the most fantastic encore to one of the city's craziest building escapades. The 60-story tower can only be likened to the great tower in Venice and the Duomo's campanile in Florence. Cesar Pelli has taken the architectural vocabulary of Carnegie Hall and composed a brilliant and original essay on high-rise design and urban sensitivity. The tower's highly patterned facade echoes the concert hall's orange and brown colors but also introduces a dark green banding near the top of its east setback and the crown of the tower, presumably a reference to a green mansard-style roof that Barbaralee Diamonstein mentions in her book, "The Landmarks of New York," published in 1988 by Harry N. Abrams Inc. She wrote that the mansard roof was removed in 1894 "to build the crowning studio floor." The tower's remarkably thin slab extends through the block from 57th Street to 56th Street and would be widely considered New York's most dramatic "sliver" building were it not for the fact that its west facade faces smack into the black facade of the Metropolitan Tower (see The City Review article), which is almost as tall and the separation between the two is only about 20 feet, the width of the Russian Tea Room building nestled between them. 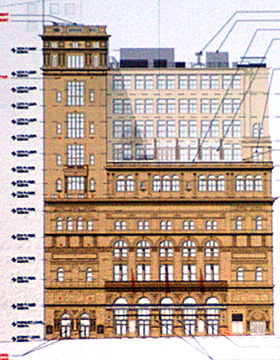 Harry B. Macklowe, the developer of the Metropolitan Tower, originally planned a much larger development that would have included not only his own site, but also the restaurant's and the lot on which Carnegie Hall Tower was erected. He had reached tentative agreements with Carnegie Hall about its lot, but Faith Stewart-Gordon, the owner of the restaurant, refused repeated offers from Macklowe, and later from the Elghanayan brothers who own Rockrose Development Corporation that built Carnegie Hall Tower. As a result of her intransigence, two very tall towers, both slightly under 800 feet in height, were built rather than one that would have been more efficient and economic, with greater benefit to Carnegie Hall, as well as having made better planning sense. The escapade was compounded by the concomitant planning and controversy of CitySpire directly across 56th Street from both the Metropolitan and Carnegie Hall towers. CitySpire is the tallest of the three, but its mid-block location on a sidestreet makes its presence somewhat less visible as the two other towers obstruct most of its views to the north. This "tuning fork" trio of resonating verticality is without precedent in the city as far as their precipitous proximity to one another. Not even Wall Street's famed canyons have anything comparable. Across town, the Trump Tower (see The City Review article) and the IBM and Sony Buildings, on the same cross streets as this trio, perform an equal function of architectural interplay but on a lower and broader scale. Pelli properly took his design cue from Carnegie Hall and not the tower's two arrogant and older neighbors. His tower is not only the perfect backdrop and foil for the famed concert hall, but also raises it to a very noble height by its superb quality, awesome and fine proportions and exceeding handsome facade and coloration. While it bears some spiritual kinship with the Fred F. French Building (see The City Review article) on Fifth Avenue and the Lincoln and Chanin Buildings on East 42nd Street, Pelli's tower combines a simplicity of form and richness of patterning that raise it above those building's fine standards. But Pelli, whose first major design was the abstract and decidedly modern Pacific Design Center in Los Angeles, whose first building is affectionately known as the "Blue Whale," is not limited by rigid "isms" and this Post-Modern tower has a brilliant modern crown. While not a Deconstructivist, Pelli has experimented with structural expressionism and here he has reinterpreted the cornice in a highly imaginative way. Instead of a projecting decorative cap, Pelli has protruded spokes on three of the tower's top facades that clutch at the proverbial passing clouds and passionate dreams wafting up from the concert hall. Not trellises, nor pergolas, nor gargoyles, they are merely symbolic, aggressive but minimalistic, and decidedly modern. While he clearly made the right decision, it would be interesting to hear Pelli explain why he chose not to wrap them continuously around the three facades and instead contained them on each facade. It would also be interesting to know how he convinced the developers to go along with such an interesting experiment, which is very effective if not beautiful. Bravo for courage! The building has a through-block lobby that is handsomely designed with red and green marble and has vaulted, metal grill ceilings and metal grill wall lamps, as shown at the right. "In the spring of 1887, Walter Damrosch set sail from New York City to his native Germany for a summer of study with the renowned conductor Hans von Bulow. It was a busman's holiday of sorts for the twenty-five-year-old musician, who in the two years since the death of his father, Leopold Damrosch, founder of the Oratorio Society and the New York Symphony, had become known to music lovers in New York as the baton-wielding figure at the Metropolitan Opera House. Little did the young conductor guess that the summer was also to be the prelude to his father's fondest dream: a great concert hall for New York City. "As fortune would have it, Andrew Carnegie, czar of America's steel industry, was also aboard the steam packer, bound for Perth, Scotland, with his bride to enjoy an extended honeymoon....Soon into the voyage, the two men were introduced. Having served on the board of the Oratorio Society, Carnegie was well acquainted with the elder Damrosch's lifelong efforts to bring music to the masses, and he commended Walter for having chosen to follow in his father's footsteps....More than once during their discussions, Damrosch suggested to Carnegie that he build the concert house New York lacked....In 1889, Andrew Carnegie presented the city of New York with a $2-million gift, still on paper, called Music Hall. The site purchased by the philanthropist for the concert house (renamed Carnegie Hall in 1898) was located on Seventh Avenue and Fifty-seventh Street, near a stretch of vacant lots, coal yards, and scattered rowhouses. Only the Osborne, a gracious apartment house built a few years earlier and situated catty-corner from the concert hall to be, foretold the elegant future that Carnegie's 'tone temple' would bring to Fifty-seventh Street....The architect retained to design Music Hall was William B. Tuthill, a thirty-four-year-old New Yorker who in all likelihood won the important commission by virtue of his reputation as a gifted musician and a fine singer - which, in 1889, far outstripped his reputation as an architect." The hall's great acoustics eventually became the home of the New York Philharmonic Orchestra and the favorite hall of the world's greatest musicians such as Rachmaninoff and Vladimir Horowitz. In the 1950's, however, the orchestra planned to move to new quarters in a major urban renewal project known as Lincoln Center on the Upper West Side and Robert Simon Jr., who had bought Carnegie Hall from Carnegie's estate, indicated it might be demolished for redevelopment. In 1956, developer Louis Glickman took an option on the Carnegie Hall property and the next year, his architects, Pomerance & Breines, published a rendering of the hall's replacement, a 44-story office tower, clad in red porcelain enamel, without setbacks set in a sunken plaza with a bridged entrance over the plaza. The startling and rather daring design set off alarms in the music world, but the city was a decade away from designating and regulating landmarks. Glickman ultimately decided not to exercise his option, but by early 1960 Simon announced he would demolish the hall that summer. Isaac Stern, the violinist, organized a committee to try to save the hall and eventually was able to convince State Senator MacNeil Mitchell to introduce two bills in the State Legislature to authorize the city to issue bonds for a nonprofit organization that would operate Carnegie Hall, which was designated an official city landmark in 1967. Stern remained a stalwart supporter of Carnegie Hall and was deeply involved in its $50 million renovation in 1986. James Stewart Polshek & Partners oversaw an admirable and sensitive reconfiguration of the hall and its public spaces that was a substantial improvement with a good deal of taste. Carnegie Hall's superb acoustics survived the rehabilitation while the acoustics at Avery Fisher Hall at the Lincoln Center for the Performing Arts that had become the new home of the renegade New York Philharmonic were not very good to begin with and did not get much better after a couple of major renovations. Maybe there is justice! The renovation unfortunately left the fire escapes on Seventh Avenue that were not part of the original design and which have been the greatest blight on the city's architecture even if they serve an important safety purpose. In addition to the concert hall, the building contains more than 100 studios in a 15-story tower on 57th Street, a 12-story tower on 56th Street and directly above the concert hall. The studios were created especially for music rehearsal, dance and small performing groups and were the result of a plan by The Art Students League and Andrew Carnegie. No two are alike and many are duplexes and have large skylights. the first tenant was the American Academy of Dramatic Art and among the residents and students who have been in the studios are Marilyn Monroe, Marlon Brando, Isadora Duncan, Jerome Robbins, Agnes de Mille and Leonard Bernstein. Enrico Caruso was said to have found the acoustics of Studio 826 so good that he made his first recording there with RCA Victor. The only floor that connects the North and South towers is the eighth. The Carnegie Hall Corporation began to warehouse some of the studios in 1991 and by May 2007 only 55 remained occupied but were given notices of eviction. 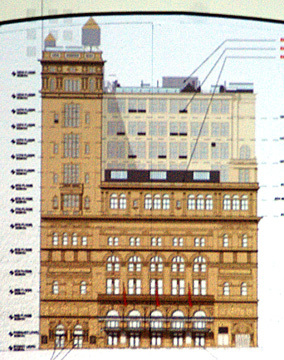 An article by Daniel J. Wakin in the October 11, 2007 edition of The New York Times reported that the architectural firm of Natan Bibliowicz had been hired to design a $150 million expansion of Carnegie Hall into the studio towers. Mr. Bibliowicz is the son-in-law of Sanford I. Weill, the chairman of the Carnegie Hall Corporation and the former chairman of Citigroup. The article said that the corporation was "impressed by a previous design by his firm: the design of the well-regarded new home of the Alvin Ailey American Dance Theater, where the chairwoman is Mr. Bibliowicz's mother-in-law, Joan H. Weill. Mr. Weill and his wife have given more than $50 million to Carnegie Hall over the years, according to the article. Apart from the question of the possible impropriety of the appointment of Mr. Weill's son-in-law for the expansion, the expansion itself is highly questionable, especially given the fact that there were in 2007 several very major new building projects planned in the vicinity that could easily accommodate whatever educational expansion plans Carnegie Hall has. 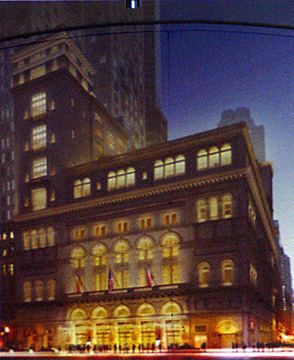 An article by Wendy Goodman in the December 30, 2007 edition of New York magazine reported that "there are 33 occupied apartments remaining" and the the others are being gutted and remodeled by the Carnegie Hall Corporation to convert them to "educational facilities" for young musicians. The article said that the corporation has "promised to find comparable apartments for the seven rent-controlled tenants...and to pay the difference in rent for the remainder of each tenant's life, but the 26 non-rent-controlled commercial and residential tenants...have no such guarantee, and received eviction notices last year," adding that "In December, a New York City civil court judge ruled in favor" of the corporation, but that the group of tenants is appealing. The Landmarks Preservation Commission held a hearing June 16, 2009 on a major renovation and modernization plan for the Carnegie Hall building, which is famous not only for its concert halls but also for its artists' studios, many of them skylit, that have been used in the past by such famous cultural figures as Isadora Duncan, George Balanchine, Jerome Robbins, Lee Strassberg, Childe Hassam, and Enrico Caruso and whose present tenants include Editta Sherman, a 97-year-old photographer who testified today against the plan, Tod Williams and Billie Tsien, architects, and Bill Cunningham, the wonderful New York Times photographer who arrives at all the best places on his bicycle. There were more than 100 large, high-ceiling artists' studios on the upper floors of the landmark building on the southeast corner of 57th Street and Seventh Avenue and Carnegie Hall has gotten rid of 101 tenants since it announced its plans in 2007. The six remaining tenants are rent-controlled and have refused buyout offers. 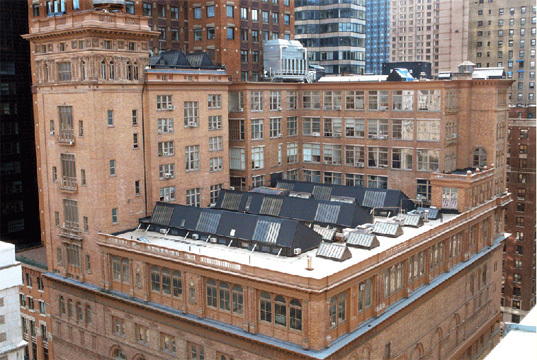 Carnegie Hall wants to convert the spaces to classrooms and music education facilities and to replace the saw-tooth, skylit roof with a large roof garden with a retractable awning overlooked by a dining hall and a glass-enclosed elevator. 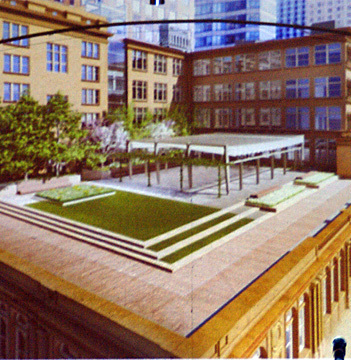 The roof garden would not be visible from the street, but is very visible and very, very dramatic from higher floors in the nearby skyscrapers. 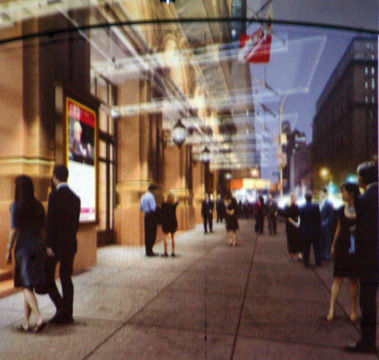 The plan would also illuminate its 57th Street facade. Robert Tierney, the commission's chairman, said that he favored the renovation plans, adding that the skylights were "not historical" and had been added in the mid-1980s and that the commission was not concerned "with the spaces below them." In the 1980s, however, the skylights were rebuilt and they had been there from the late 19th Century. The commission did not take a vote today on the application. One speaker pointed out that the interiors of Carnegie Hall were not landmarks. The original plan for the structure, which was funded by Andrew Carnegie, envisioned a roof garden, a popular building feature at the time, but it was never created and Mr. Carnegie saw this gift to the city as an important mixed-use cultural facility. The building originally was seven stories and a full floor was later added as well as a 15-story tower on the eastern side on 57th Street and a 12-story tower on 56th Street. The original architect was William B. Tuthill and Henry J. Hardenbergh did subsequent work on it. Some studio tenants indicated in the past that they were disturbed by the fact that Natan Bibliowicz, the son-in-law of Carnegie Hall's chairman and major benefactor, Sanford Weill, a former head of Citigroup, had been hired for the renovation project which is expected to cost at least $100 million and also involves getting rid of an exposed rooftop watertank, replacing the existing metal-and-glass entrance marquees with very thin glass marquees, and improving the lighting of the building's exterior. Mr. Bibliowicz, a partner of Iu & Bibliowicz Architects, previously designed a facility for the Alvin Ailey American Dance Theater. Christabel Gough, secretary of The Society for the Architecture of The City, told the commission that "the destruction of the roofscape would be destruction of a significant architectural feature which should be sacrosanct under the landmarks law." "The use of these spaces or their re-purposing," she continued, "should not be allowed to lead to the removal of the visible reminders of studio history. Nor is it acceptable to clutter the roofscape with contemporary mechanicals such as the transparent elevator tower." The Historic Districts Council gave the commission a statement in which it maintained that "While we approve of much of the restoration work and the general idea of other alterations, HDC feels strongly that alterations should recall the historic conditions of a landmark." "Although glass canopies have been approved (so many that they are starting to feel generic), HDC continues to find them inappropriate for most landmarks. Even completely glass canopies are noticeable additions to a building - they are never utterly invisible. In addition, as anyone with windows in New York City knows, they will get dirty fast and will be quite popular with birds. In this case we also find that the proposed [marquees] feel too flimsy for such a significant structure. The best alternative would be nothing, but barring that, something that harkens back to the 1908 photo with more framing, could be a welcomed addition. A middle ground between trying to deny the existence of canopies and the bulky incursions of recent decades can and should be found." "At the top of the building," the statement continued, "HDC finds the addition of the glass elevator between the two towers to be too visibly jarring. If any of it is mechanicals or an over-run, we suggest that different types of elevator technology be investigated to reduce the visibility. The roof garden is a pleasant, and historically appropriate, idea, but the proposed design does not rise to the level of the examples shown in this well-researched proposal. We ask that it be rethought to be less corporate and blocky and more in tune with the style of the building and historic predecessors. Finally, where they are visible, we ask that the number of sky lights removed be reduced. Their presence is an important reference to the studios that were once here and are a significant part of the building’s history. Much like sky lights are retained on industrial landmarks, they should be retained here." Commissioner Diane Chapin said she was concerned about the skylights that have "been an important feature" and that she felt uncomfortable with "losing a piece of social history." Commissioner Chris Moore said that the applicants made "a great presentation, but the opposition made a greater presentation." The applicant argued that the proposed new marquees will make it easier for people on the street beneath them to see the building. This "transparency" argument, however, is merely an excuse to add a bit of high-tech modernism in the form of thin glass to the complex with which it is quite at odds and not the least bit contextual. It also ignores the fact that the existing marquees are not that old and work well and that people can see the full building from across the street and the avenue. The marquees are not the big issue, of course, nor is the replacement of some fire escapes along the west wall of the 57th Street tower with a glass-front elevator to improve disabled access and make it easier to move large instruments from one tower to another. Similarly, the lighting scheme is not objectionable. What is extremely objectionable, however, is the "roof garden" scheme that would do away with the spectacular mountainscape of skylights on the roof of the artists' studios atop the main concert hall that would be replaced by classrooms. The artists' studios were without question the greatest ever created in the city, even better than the fabulous Studio Building (see The City Review article) at 51 West 10th Street that was demolished for a bland mid-rise, mid-block apartment building in the 1950s. The Studio Building houses most of the country's greatest painters. The Carnegie Hall Studios, on the other hand, housed a much wider assortment of artists, not all of whom were household names, and in so doing nurtured a beehive of cultural activity that epitomized urbanity: great, broad staircases connected unaligned floors and broad hallways were full of surprises with some doorways opening onto to ballet classes and others to architects' offices and still more to painters' studios and musicians' lairs. Getting off the elevator at the wrong floor was one of the great experiences in life, one best captured in the wonderful scene in Truffault's masterpiece, "Shoot the Piano Player" (see The City Review article), when Charles Aznavour waits outside a rehearsal room while a violinist finishes her audition and then enters and closes the door and as the woman with the violin walks away down the long hall she suddenly stops for a moment at Aznavour's first piano chords and then continues, her face almost expressionless, perhaps because she recognized she was hearing brilliance that she lacked. It is shocking that the commission would entertain the ravaging of these studios and the great skylights on the grounds that they were not original and argue that a roof garden was originally contemplated. First of all, there are no plans showing the "original" roof garden and certainly the one now proposed bears no possible resemblance to such a plan. Secondly, the studios are definitely historically very important not just to the building but to the city. Thirdly, Carnegie Hall's intention to convert these very special and very unusual and very memorable spaces to routine classrooms and offices and the like is philistine and completely unnecessary especially when the midtown office market has plenty of available space to rent in the neighborhood in existing buildings as well as new ones including one very major one across the street. The article said that Elizabeth Sargent, "a one-time dancer noted for her bold sexual poetry, is now in her 80s and in remission from cancer" and "has until August 31 to clear out" of the ninth floor apartment she has lived in for 40 years. "All of her neighbors are gone, forced out...[of] the affordable studios that for more than a century housed some of America's most brilliant creative artists," the article maintained. "Musicians, painters, dancers and actors thrived in the two towers built by 19th-century industrialist Andrew Carnegie just after the hall went up in 1891. The towers - one 12 stories high, the other 16 - housed more than 100 studios, some with special skylights installed to give painters the northern light they prize. Over the years, Marilyn Monroe, Grace Kelly and Robert Redford took acting lessons here and Lucille Ball had voice coaching. James Dean studied scripts and Leonard Bernstein, music. Women once lined up on the street to visit an alluring resident – the young Marlon Brando. His studio space on the eighth floor was demolished in early July," according to the article. Editta Sherman, a 98-year-old photographer, had a studio that's still filled with portraits of Hollywood and Broadway stars. She's not been allowed to sleep there since early July and must also remove her belongings by Aug. 31. She and Ms. Sargent recently signed agreements with Carnegie in exchange for new midtown Manhattan apartments where rents will be subsidized by Carnegie for the rest of their lives, the article said. The building is undergoing a $200 million renovation that will create administrative offices for the Carnegie Hall Corporation and a youth music program named after Sanford "Sandy" Weill, the former chairman and CEO of Citigroup. When Carnegie Hall announced the project in May 2007, 18 studios were occupied and dozens of other artists rented teaching space.